The all-new adventures of the first female private eye continue! 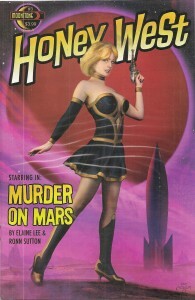 Join Vertigo’s Elaine Lee as Honey goes undercover on the set of low-budget sci-fi film Amazons of Mars to investigate the mysterious death of Zu Zu Varga, queen of the B-movies. Was it the scheming ingénue, the down-on-his luck director, the jealous agent, or the ageing teen heartthrob? Robots, aliens and murder in 1960s CA! Hey B movie scream queen getting killed off to detail the production of a B-movie. It’s awesome all the way through on this one. There is nothing better than the whole premise and something of a staple for crime noir dramas. This one is rather well done overall, with very good and funny dialog, art is well done, and lettering that is easy to read, in all just a nicely put together comic book that will make your whole day. I am going to rate this one at five of five, because I love Honey West. Moonstone has done a good job with this one, and everything just works here when it comes down to reading this. As a back issue this is so worthwhile to pick up and read. It does not look like there is a e-comic version of this title anywhere, so we are really just limited to print, and the back issue catalog over on Ebay. This title does not exist in Amazon. Overall, worth hunting down and enjoying, you really won’t be disappointed if you love crime drama and Honey West as a character.